The Snowy Mountains Scheme holds a unique position in the nation’s cultural landscape. It came into being shortly after World War II as Australia loosened its ties with Britain and came to regard itself as a growing nation, responsible for its own destiny. The Scheme became a symbol of what can be achieved through hard work and determination; it is also a great social achievement. Moreover, there is no doubt that it has made a significant contribution to the economic development of modern Australia. As part of the topic, Post-war Australia to the 1970s, Stage 5 of the NSW History Syllabus requires students to examine the contribution migrants made to Australia’s social, cultural and economic development. The Snowy Mountains Scheme provides an appropriate case study for students to research the lives of the 60,000 New Australians, who came from over 30 different countries to help to build what is officially recognised as one of the civil engineering wonders of the modern world. This classroom resource is designed to complement activities already programmed by history teachers. The posters, ‘Life’ and ‘Work’ during the early days of construction, represent a selection of the 80,000 black and white photographs. The video is a compilation of historic early footage shot by Snowy personnel, together with excerpts from a variety of sources whose contribution we gratefully acknowledge. An activity sheet, a photo library CDROM and research topic completes the package. 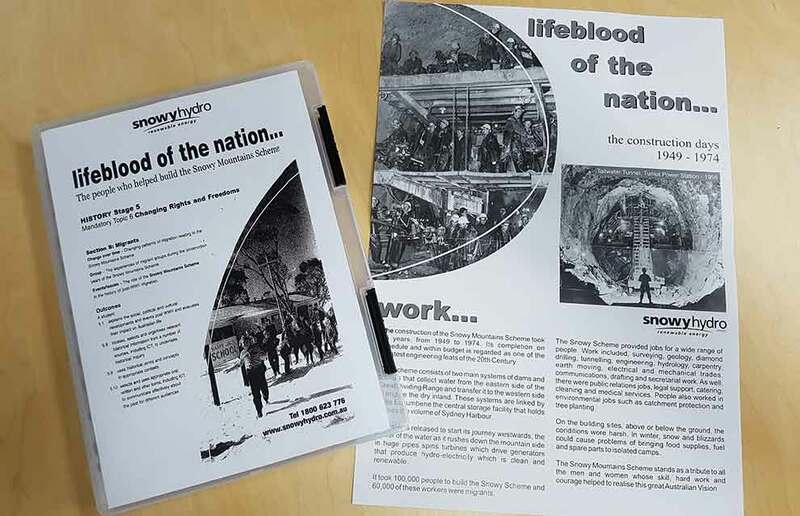 To order the ‘Lifeblood of the Nation’ Education Kit contact the Snowy Hydro Discovery Centre on 1800 623 776 or education@snowyhydro.com.au.